Wie und wo übernachtet man auf einer solchen Reise durch Afrika? Tunisia is great for bushcamping! Many great places and nobody stop by. We bushcamped all the way up inland from Libyan borader to Tunis. We got a 10 days visa easily within 12 days from the libyan consulate in Alexandria (N 31 11.851 / E29 54.728). Same at embassy in Cairo. Since we could keep our passports during waitingtime and just hand them in for issuing the visa at the end, we could travel around Egypt while waiting. Leptis Magna Camping N 32 37.912/E 14 17.384 Opposite Parking of Leptis Magna, very loud, but shadow under palmtrees and grass, clean toilet/shower. Maybe camping also possible on parking 2 of Leptis Magna just opposite Campsite for free. Leptis Magna worth a days visit!!! The best preserved roman ruins we ever saw. Hugh place and not one other tourist! North of Asswan Peaceful place on the westbank of the Nile (crossing the Nile over the new bridge and drive back south), nubian house with rooms to rent, camping outside on the road, overlooking Nile, very friendly owner, no shadow, many wild dogs at night. Cairo Salma Camp N 29 58.170/E 31 10.540 The only open campsite in Cairo when we were there. Nothing nice (except the view of the pyramids) but ok. Many wild and some tame dogs. Western Desert Road Luxor-Cairo: beautiful desert scenery with nice oasis, highlight is the white desert (turn off: N 27 21.530 / E 28 10.041). We heard that organised desert trips for a couple of days from baharyia or farafra are very nice – but not in summertime! Namanga River Hotel S 241.432 / E 36.47.413 In town but quiet, nice and green, good for stopover for or after Amboseli NP, several dogs at night (10-6) to guard the place, keep own dog inside at night. Outside of park, drive through park to south end Simple but nice, big campsite, 500KS/p, beautiful park with Kili and lots of animals. 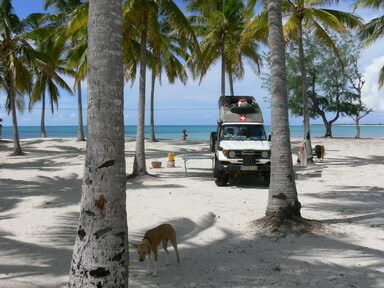 We smuggled dog in, no problem at campsite, just make sure, dog stay near the car (hyenas at night etc.) Bad road (corregation) from Namanga (50km), at campsite they offer tour to nearby masai-village (bargain for price, we paid 500KS for 2 Persons), very friendly masai, no hassle!, interesting tour, possible to take picture of people for free! Eldoret, Naiberi Riverside Camping, S 0.26.862 / E 35.25.327 – very beautiful campsite (expensive) but they have 7 big and a bit aggressive dogs (1f+6m), our dog was seriously attacked and bitten there! ☺Pangani Peponi Beach S 5 17.235 / E 39 03.939 Beautiful and quite campsite directly at the beach. Nice bar and restaurant, great for relaxing! 1 dog and 4 cats at owners house. Kipepeo don’t allowed dogs anymore! Iringa Old Farmhouse 50 km southwest of Iringa, signposted on main Road to Mbeya Nice campsite, excellent food+beautiful restaurant (a bit expensive but worth it! ), dogs of the owner around at the restaurant at night, said to be aggressive, we didn’t see them. Longido – Lake Natron – Manyara: rough, small road, very nice, unspoiled nature and masai-villages, animals, vulcanos near lake natron (climbing possible with guide), takes at least 2 days, good for bushcamps (hiding not necessary masai finde you anyway, but they are very friendly), lake natron itself is kind of park -> entering fee 15$/p+car, camping 10$/p, we just turned and bushcamped, view of lake also from the raod, gate on the way to manyara: 5$/p (no bargaining possible). Longido – Lake Natron only possible in dry season! Sipi Falls around Mt. Elgon to Kenia borader (Suam border), very nice nature and fantastic views, no tourists, small and sometimes bad piste, slippery when wet. Oudshoorn Attakwas 192, Jan van Riedbeeck Road Nice, small and friendly place owner loves overlander and stories! To Kubu Island through salt pan (from Gweta) – salt pans are very dangerous when wet! Inquire before! ☺ Spitzkoppe Spitzkoppe S 21 49.597 / E 15 10.207 (top of Spitzkuppe) just enter Park and check out campsites One of Africas nicest camping (campsites very far apart from each other) in the middle of wonderful nature!!! Bring one water/food/wood. Good for hiking. No problems with dogs. S 18 03.189 / E 13 50.627 Nice campsite next to expensive Lodge on top of a hill (also a bit expensive), have a sundowner at the lodge: beautiful view! Van Zyls Pass Freecamp on top of Pass Wonderful view down to the Marienflusstal!!! Katima Mulilo (Caprivi) Zambezi Lodge S 17 29.180 / E 24 17.113 Campsite directly on Zambezi River, nice floating bar, good to take of to Zambia, careful with dogs: there are crocs in all rivers! Epupa-Falls – Kunene River Lodge: very nice small road along Kunene River, 4x4, road not as bad as people say (took us 5 hours) but bigger vehicles (unimog etc) need longer (up to 2 days, but bushcamp very nice and no problem) worth it! For the rest (we only got a 8 day-visa) we just bushcamped along the road. No problems but be careful with landmines! Muanda Catholic Mission S 05 55.890 / E 012 20.531 Ok for camping, bargain for price! Lambaréné Mission des Soeurs de l'Immaculée Conception S 00 41.517 / E 010 13.680 Nice place and friendly sisters, but for more than one car only possible during weekend because on weekdays compound is a kindergarten.